Edit: The version listed in this post is buggy. Please consider using version 0.02 [link] or the current development version [link] instead. Here it is! The gtk version of the ips patcher I wrote earlier. It’s based on GTK. And I use Glade to create the interface. I thought I’d have to implement zillions of callbacks but in the all I had to to is attach the IPS structure to the main window, implement a callback and add a thread. This was also the occasion to clean up and simplify the IPS code. You can download it [here]. Feel free to contact me or leave a comment if you have any request or problem. Here are the mandatory screenshots! Today I wanted to try the translation of Metal Max Returns. This game looks really cool. As I’m super lazy, I ran the windows version of snes9x through wine. I haven’t tested the 64bit version yet. I realized that there’s no IPS patcher under linux. So once again I had to run a win32 IPS patcher (arkana ips) using wine. I was wondering where there wasn’t any IPS patcher under linux… Maybe the IPS format is a real mess. In fact it’s the total opposite. It’s really simple. ipsfile is the filename of the IPS patch to apply. 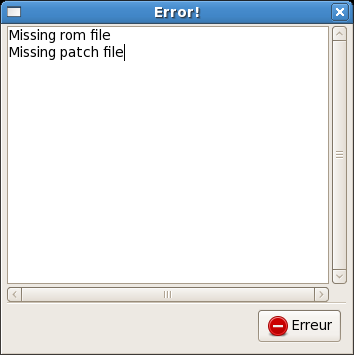 inputrom is the filename of the rom to patch. outputrom is the filename of the patched rom. It’s an optional argument. If you don’t specify it, the input rom will be saved in inputrom.sav and then overwritten. Aouch… 3 months since last post. A lot of things happened. First of all i changed job (who said lame excuse?). Then GGI was selected for google summer of code. Guess who is the GGI admin on gsoc.. me :). 2 projects from the idea list were “slotted”. This means that google will fund them. The project i was about to mentor wasn’t selected. Anyway, i hope everything will be alright because some of the selected projects are part of the 3.0 roadmap. Still about GGI, my current task is to implement Xdbe helper for X target. The task is not easy as it seems. My first try was kinda simplistic and … buggy. Instead of increasing X target speed, it slowed it down. And worst of all, i totally misunderstood the goal of Xdbe helper. It’s not just about swapping the window drawable. In fact, it’s the last and final part of the job. For the moment in X target, all the drawing operation are performed on the window drawable. Multiple buffering is performed by using window clipping. Let’s say we want a visual of 320×240 pixels and 3 frames (in order to do triple buffering, or whatever). We create a parent window with a size of 320 by 240. Then we create a child window of 320 x 240*3. We display a given frame by moving the child window so that the required area becomes visible. For example, if we want to view the second frame, we move the child window by (0,240). Back to Xdbe. We don’t need to use window auto-clipping anymore. We can use a single window with a backbuffer attach to it. If we want multiple frames, we can create a pixmap the same way we created the child window or create a pixmap per frame. All the drawing operations will be perfomed on the pixmap. Then on flush, we copy the pixmap data to the backbuffer and swap the window. It’s not as easy as it sounds because i’ll have to reorganize (or completly rewrite) the X target. The pcengine tracker development was resumed this week. I hope to release a test rom for the instrument editor before the end of the month. I put a link (“Doodles, drawings, sketch dump…”) to it in the section “My other stuffs”.